So as you know, I like to stick to the traditional versions of the food on my list. My whole schtick is to get a feel for the classic flavors and methods. I’ve had eggplant parmesan. Or rather, I’ve had “eggplant parmesan” (quotes intentional) which was pretty much breading covered in sauce and cheese. OOhhh, someone’s feeling a little snobby! I was hoping that when I tackled this recipe it would be better than the restaurant versions I’d had in the past. More flavorful and more interesting. (Seriously, so snobby!) 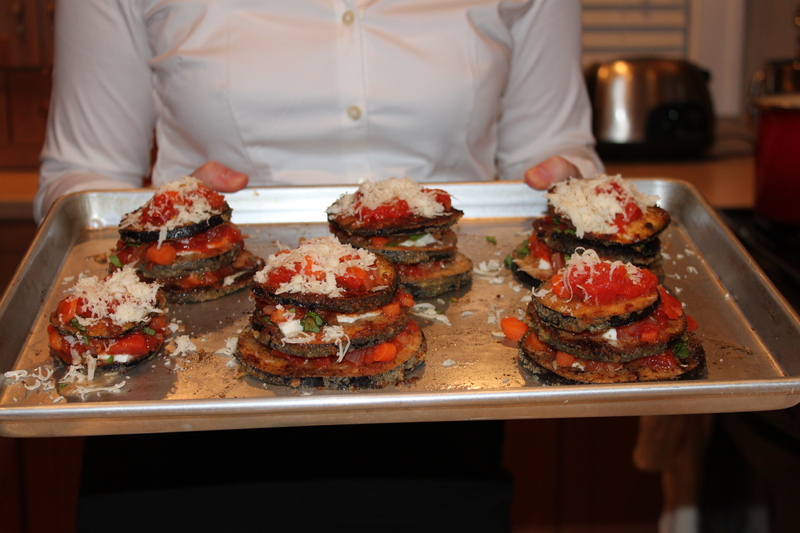 So I had an open mind when I found this non-traditional but still authentic recipe from Mario Batali: Parmigiana di Melanzane. Step one with any eggplant recipe is to remove the bitterness from the eggplant. This is done with a mixture of white wine and group therapy. Or maybe just salt. Slice the eggplant, sprinkle with salt, and let sit for 30 minutes while the bitter juices weep out of the eggplant. For real, it’s called “weeping”. Letting the eggplant "weep". I couldn't tell if it was weeping out of joy or sadness...eggplant are tricky like that. While the eggplant was weeping, quietly thank goodness, I made the basic tomato sauce, which is really simple. Saute your onions and garlic in olive oil. Add fresh thyme and chopped carrots. Then add your can of whole tomatoes and cook for 30 minutes. Simple! So our sauce is cooking and we’re done weeping (for now). Rinse and dry the eggplant…maybe with a few words of encouragement since its probably still emotional. 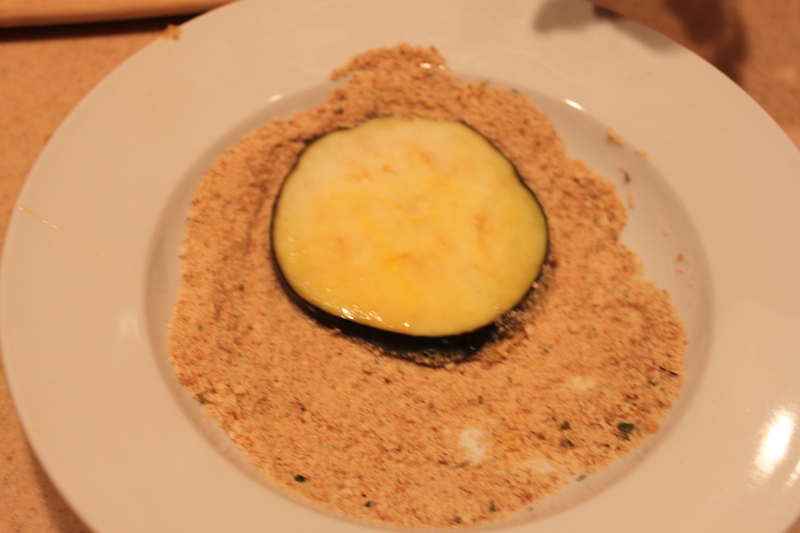 The eggplant now gets dipped in egg and pressed into the breadcrumbs to coat. 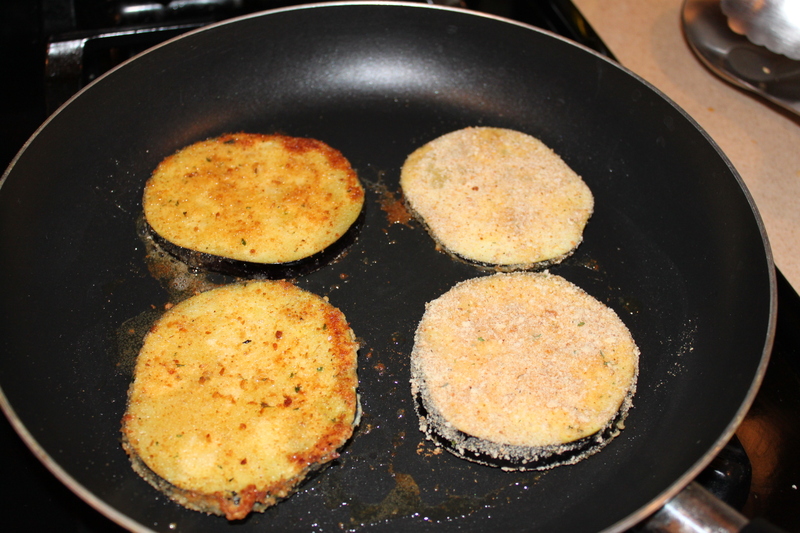 Now that the eggplant has wept, it gets a coat of breadcrumbs. After I weep, I usually just get ice cream. Mario’s recipe doesn’t call for dipping in egg, but all the reviews stated that it was hard to adhere the breadcrumbs without it. So, I went with my instinct and dipped the eggplant first. The eggplant was no longer weeping, but rather was rejoicing, because what isn't happier when breaded and fried!? 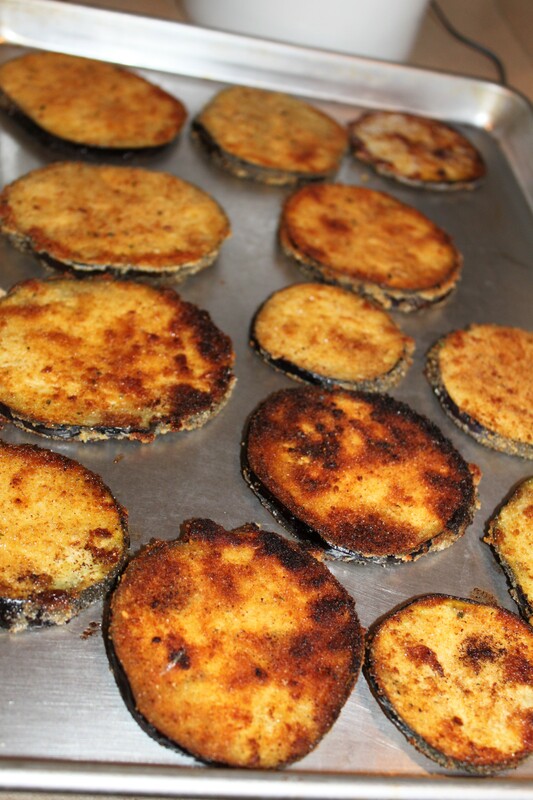 Breaded, fried eggplant...not a tear in sight! 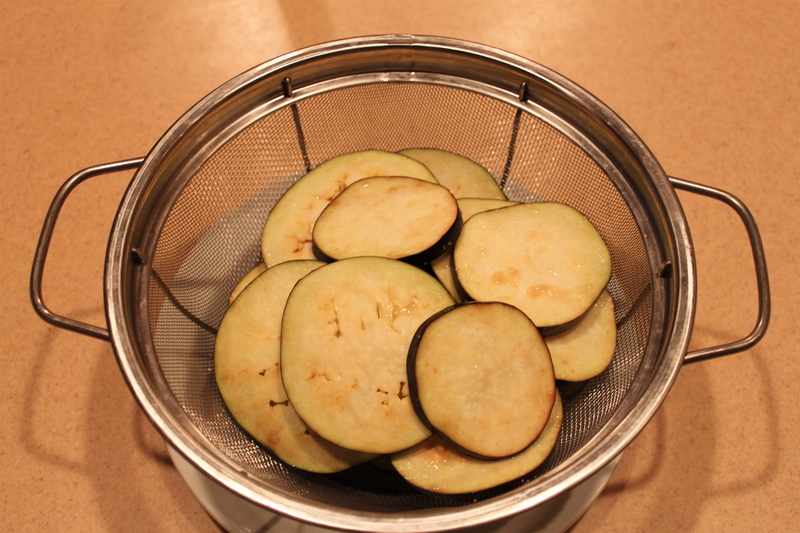 As you can tell, there are varying sizes of eggplant. Choose the largest ones to be the “base” of each of your stacks. 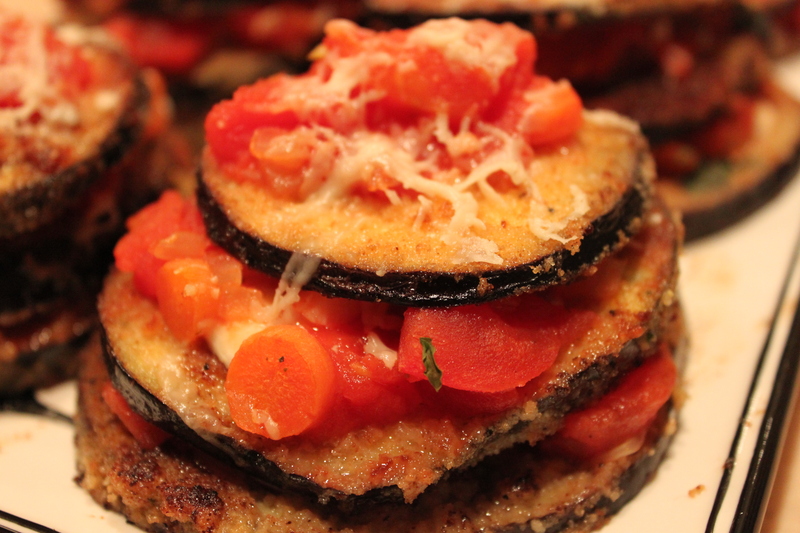 Towers of eggplant. And yes, I'm cooking in a pure white button down shirt....I like to live dangerously. So now our stacks are ready for the 350° oven. They go in for a brief 15 minutes to melt the cheese into the warm loveliness that pretty much equals Eggplant Parmesan. GORGEOUS! Melty, crispy and a little sweet. 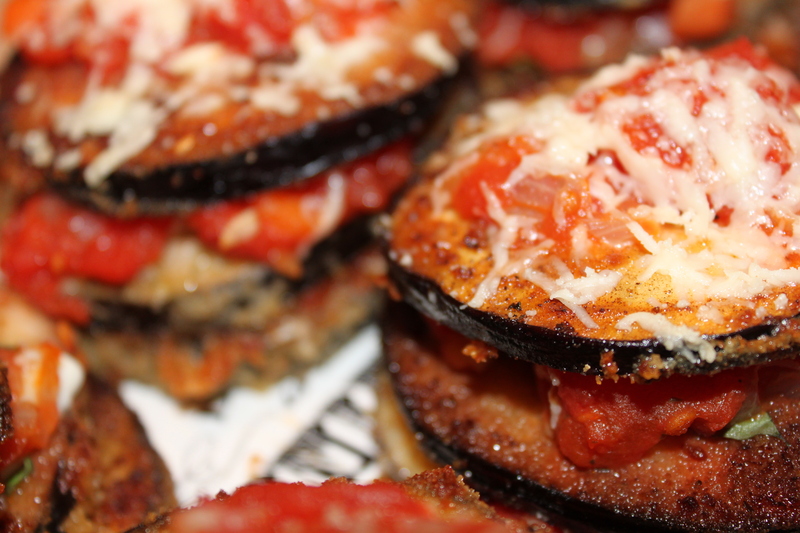 I hate to say it, but they were way better than your typical restaurant “eggplant parmesan”. Actually…I don’t hate to say it, because it was really good. Seriously...don't these look SO much better than the stuff hidden under the blanket of cheese!? So as you can tell by my enthusiastic captioning, they were delicious. The eggplant was al dente, the sauce was light and a little sweet and they still had the appeal of frying and cheese. Because I’ll readily admit…its still about the frying and the cheese. UNFORESEEN BONUS(ES): 1. The sauce: make it. Simple, fast and delicious. A PERFECT topping. This Batali guy might really catch on. 2. No meat!! I usually have to think ahead to cook vegetarian, but this was perfect for Friday meal when meat was verboten for us and our house guests. Totally had them convinced I was a pro. Dinner was light and satisfying, the snobs guests were happy, no one wept except for the eggplant. p.s. Things are slowing down in the Flyover house after an extended busy season at work. More posts at a much quicker rate. HUZZAH! 4. 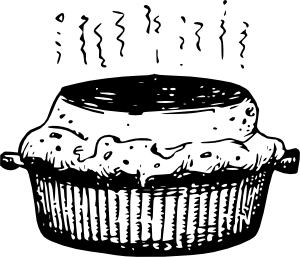 New HOT DISH feature: There is so much food literature out there. From books on eating well to collections of personal essays on food, to behind the scenes stories from some of America’s top restaurants. So each week, I’ll link to a new food book for you to check out. 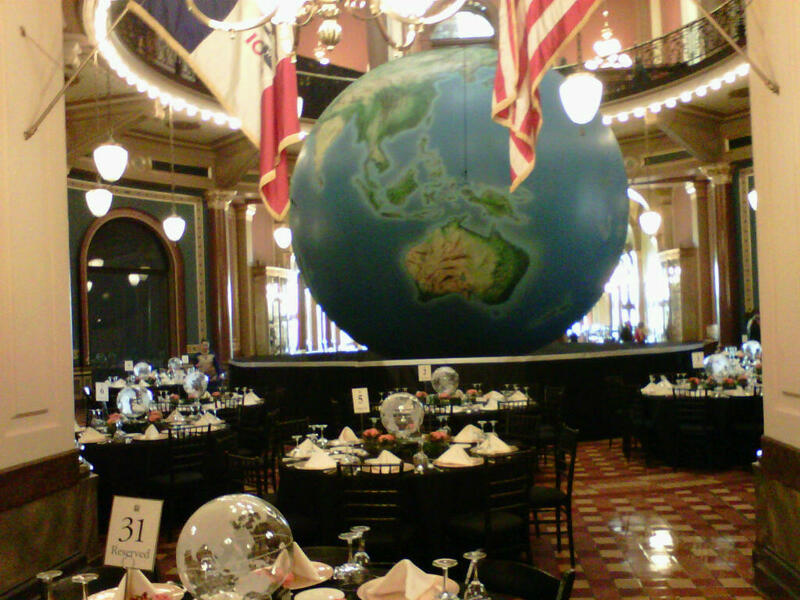 Hope I peaked your appetites looking ahead to this gorgeous fall weekend. More next week including our FINAL 30 before 30 recipe post.